In April the HEINKEL DRYING AND SEPARATION GROUP has presented its portfolio at CIPM in China and Powtech in Germany to international trade show visitors. Several hundred visitors at the booth were able to get an impression of the group of companies´ expertise in filtration, centrifugation, mixing and drying technology at China International Pharmaceutical Machinery Exposition (CIPM) at Qingdao. At the probably largest pharmaceutical machinery industry show in Asia the exhibits of the HEINKEL group received a lot of interest, particularly the BOLZ conical mixer /-dryer with orbital arm. Also the HEINKEL ball segment valve as well as a model of the HEINKEL inverting filter centrifuge HF 600 has attracted a lot of attention of the visitors. In 2013 some additional fair trades in Asia are still on the agenda. Moreover, the group of companies shows its growing engagement in Asia by a new sales engineer at the Chinese office in Wuxi near Shanghai. At Powtech in Nuremberg, the international trade fair for Mechanical Processing Technologies and Instrumentation, HEINKEL group presented its innovations to an international audience of experts. 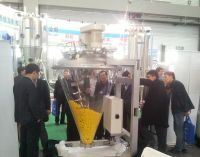 Especially the new BS-pilotDRY® of BOLZ with an innovative hybrid stirrer was in the focus of the trade show visitors. Also the vertical top-discharge centrifuge V 400 TP with a newly designed bearing unit as an exchangeable cartridge and the new HEINKEL ball segment valve of the ULTIMO series attracted a lot of interest. „The previous fairs mark a good starting point for new business in 2013“, says HEINKEL´s managing director Thomas G. Kleiner satisfied with the exhibitions in China and Germany.